Rutgers University Press, 1991-07. Hardcover. Good. Rutgers Univ Pr. Used - Good. Shows some signs of wear, and may have some markings on the inside. 1987-07-03. New. Ships with Tracking Number! INTERNATIONAL WORLDWIDE Shipping available. Buy with confidence, excellent customer service! Rutgers University Press, 2006-11-03. Hardcover. Good. 2004-11-29. Good. Ships with Tracking Number! INTERNATIONAL WORLDWIDE Shipping available. May not contain Access Codes or Supplements. May be ex-library. Shipping & Handling by region. Buy with confidence, excellent customer service! Rutgers Univ Press, 1987-12. Hardcover. Good. Free Assn Books, 1991-08. Paperback. Good. Free Association Books. PAPERBACK. 0946960569 New Condition. . New. Free Association Books. PAPERBACK. 0946960569 Like New Condition. . Fine. Rutgers Univ Pr. Used - Good. Former Library book. Shows some signs of wear, and may have some markings on the inside. Rutgers University Press, 2006-11-03. Hardcover. Used:Good. Free Association Books, 1987. Paperback. Very Good. Free Association Books, 1987. Inscribed: "To Joe and Ann with gratitude and affection," and signed by Martin Bernal on title page. Vol. 1: The Fabrication of Ancient Greece 1785-1985. Light wear, creasing to cover. Secure binding. Rutgers Univ Press. Hardcover. POOR. Noticeably used book. Heavy wear to cover. Pages contain marginal notes, underlining, and or highlighting. Possible ex library copy, with all the markings/stickers of that library. Accessories such as CD, codes, toys, and dust jackets may not be included. Rutgers University Press. PAPERBACK. 0813512778 Special order direct from the distributor . New. Rutgers University Press. PAPERBACK. 081351584X Special order direct from the distributor . New. Vintage/Ebury (a Division of Random. PAPERBACK. 0099887800 New Condition. . New. Rutgers University Press. PAPERBACK. 081351584X New Condition. . New. Rutgers University Press. PAPERBACK. 0813512778 New Condition. . New. Free Association Books, 2004-01-01. Paperback. Good. Rutgers University Press, 1991-02-01. Paperback. Used:Good. Rutgers University Press, 1991-06-01. Paperback. Used:Good. Vintage/Ebury (a Division of Random. PAPERBACK. 0099887800 Like New Condition. . Fine. 1987-07-03. Good. Ships with Tracking Number! INTERNATIONAL WORLDWIDE Shipping available. May not contain Access Codes or Supplements. May be ex-library. Shipping & Handling by region. Buy with confidence, excellent customer service! Free Association Books, 1991. Very Good Paperback. Volume Two Only. Paperback. Very Good. Free Association Books. Used - Good. Ships from UK in 48 hours or less (usually same day). Your purchase helps support the African Children's Educational Trust (A-CET). Ex-library, so some stamps and wear, but in good overall condition. 100% money back guarantee. We are a world class secondhand bookstore based in Hertfordshire, United Kingdom and specialize in high quality textbooks across an enormous variety of subjects. We aim to provide a vast range of textbooks, rare and collectible books at a great price. Through our work with A-CET we have helped give hundreds of young people in Africa the vital chance to get an education. We provide a 100% money back guarantee and are dedicated to providing our customers with the highest standards of service in the bookselling industry. New Brunswick: Rutgers University Press. 1987-1991. 2 vols. (xxxii, 575; xxxiii, 736p. ), stiff wrappers. Contents: v. 1, The farication of ancient Greece 1785-1985. v. 2, The archaeological and documentary evidence. Rutgers University Press, 1987-01-01. Paperback. Good. Rutgers University Press, 1987 Reprint. Soft Cover. Very Good. Rutgers University Press, 1991 Reprint. Soft Cover. As New. Rutgers University Press. PAPERBACK. 0813512778 Like New Condition. . Fine. Rutgers University Press. PAPERBACK. 081351584X Like New Condition. . Fine. Rutgers University Press, 1987-01-01. Paperback. Like New. As new clean tight and bright Please email for photos. U.S.A.: Rutgers University Press, 2003. Very good paperback. Like new.. Paper Back. Very Good. Free Association Books, 1987. Soft cover. Very Good. 8vo - over 7¾ - 9¾" tall. 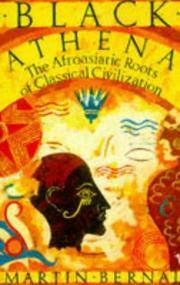 Other than name an unmarked copy-Black Athena: The Afroasiatic Roots of Classical Civilization, its three volumes first published in 1987, 1991, and 2006 respectively, is a controversial scholarly work by Martin Bernal. He discusses ancient Greece in a new light. Rutgers University Press, 1991-06-01. Paperback. Good. Rutgers Univversity Press, New Brunswick: 1987. Softcover. Good condition. ISBN: 0813512778. Rutgers University Press. Soft cover. Both volumes show extensive notes to first page and inside covers, light underlining in both, else tight and clean. . Very Good. 1987. Paperback 1st. Rutgers University Press, New Brunswick, NJ, 1987 Two volumes. Small quartos, softcovers, both near fine. Volume I 575 pp. including index. Volume II 736 pp. including index. Winner of the American Book Award What is classical about Classical Civilization? In one of the most audacious works of scholarship ever written, Bernal challenges the whole basis of our thinking about this question. Classical civilization, he argues, has deep roots in Afroasiatic cultures. But these Afroasiatic influences have been systematically ignored, denied, or supressed since the eighteenth century--chiefly for racist reasons. The popular view is that Greek civilization was the result of the conquest of a sophisticated but weak native population by vigorous Indo-European speakers--or Aryans--from the North. But the Classical Greeks, Bernal argues, knew nothing of this Aryan model. They did not see their political institutions, science, philosophy, or religion as original, but rather as derived from the East in general, and Egypt in particular. Black Athena is a three-volume work. Volume 1 concentrates on the crucial period between 1785 and 1850, which saw the Romantic and racist reaction to the Enlightment and the French Revolution, and the consolidation of Northern expansion into other continents. In an unprecedented tour de force, Bernal makes meaningful links between a wide range of areas and disciplines--drama poetry, myth, theological controversy, esoteric religion, philosophy, biography, language, historical narrative, and the emergence of modern scholarship. Vintage/Ebury (a Division of Random. PAPERBACK. 0099887800 Brand New ,Original Book , Direct from Source , Express 5-8 Business days worldwide Delivery. . New.